As Hospitality and Hotel Industry professionals at HSMAI we know you’re looking for a banquet of career and business development resources, and we’re right there, feeding you the latest global and regional hospitality industry trends through education, events and training courses. You’re thirsting for knowledge, and we are your mini-bar of education, filled with industry peer interaction sessions and industry certifications for hotel and hospitality HSMAI members. Join HSMAI as members can attend our Hospitality and Hotel Educational Training Workshops and Events in 10 cities across the Asia Pacific completely FREE! Find out more..
Join and become a member to receive a discount on all our HSMAI Industry professional online training courses and in 2018, some new courses will be FREE for members! Membership helps you stay ahead of the curve by providing you with access to exclusive content from thought leaders, publications, research reports & insights from leaders in hospitality in Asia Pacific. HSMAI members are invited to volunteer as Board Members of National Boards or discipline-specific Advisory Boards such as our Hotel Revenue or Hospitality Digital Marketing Advisory Boards, or on various projects. HSMAI runs over 30 Training Workshops in Asia Pacific every year to assist members with peer to peer networking and industry career development. We also run specific Workshops for General Managers in the Hospitality and Hotels sector. Members can attend our Educational Training Workshops and Events in 12 cities in the Asia Pacific completely FREE! Our Hospitality training sessions run throughout the year. Checkout our Hospitality and Hotels Industry Training Workshops to find a session near you. Get Certified! Put yourself ahead of the pack! The more you know, and the more you can prove you know, the better ROI you can provide to your employer or prospective employer. The more you can improve your company’s bottom line, the better you can position yourself in your chosen discipline. 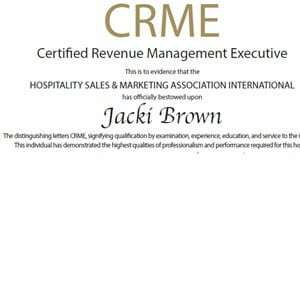 HSMAI introduced certification for hotel sales professionals nearly thirty years ago. Today ,HSMAI offers training and certification in several disciplines, including revenue management, business acumen, and the newest, digital marketing. Of course, HSMAI members can access our Certifications for a discounted price. Checkout the Certifications we have on our HSMAI Academy website. If you’re interested in to learn more including the qualifications and procedures to apply, and to download applications. For groups of 10 or more, bulk discounts are available. Contact Kathy Tindell for details. Members receive a discount on all our online Courses and some courses will be offered FREE for members in 2018! And many more. Checkout the HSMAI Academy for more details. Want to get some Board experience? HSMAI offers many opportunities for you to gain some board experience whilst helping your industry. There are many Expert Communities within HSMAI that offer you a chance to use your expertise and get some experience of what it is like to be on a Board. National Advisory Boards in Singapore, Australia, China, Thailand and Indonesia. You must be a HSMAI Member to apply for these volunteer positions. Bonus! Your advertisement will automatically be loaded onto the eHotelier Careers website with over 180,000 Hospitality Industry members worldwide. Looking for a new job to develop you hospitality career? HSMAI Members can reach out in a private chat to HSMAI members who post open positions. A HSMAI Membership benefit is access to our free tools and insights that help you stay ahead of the curve by providing you with access to exclusive content from thought leaders, publications, research reports & insights from leaders in the hotels & hospitality sector. HSMAI Advisory Boards develop tools and conduct research and provide free insights specifically for HSMAI members. And many more..checkout our HSMAI Knowledge Center for more details. Watch out for these events in our Insights Newsletter and on our Events page. Introducing the new HSMAI "My Hub"
The new HSMAI “My Hub” customises your HSMAI Homepage so you see the things you want to see about the discipline you’re interested in.